The announcement was made by the Minister for Families, Children and Youth Affairs Ms Jenny Mikakos, together with the Minister for Trade & Investment, Innovation & the Digital Economy and Small Business Mr. Phillip Dalidakis and Labor Party parliamentarian Mr Steve Dimopoulos in a special event at the Greek Centre, on Wednesday 7 November 2018. Minister Mikakos noted that this funding is in addition to the $370.000 for the installation of Greek Centre Parthenon freeze and has also increased the funding for the Lonsdale Street Festival. “It is a significant commitment of our government because we want to support the GCM to its future endeavours,” she said. Minister Dalidakis congratulated the Greek Community of Melbourne for its work and praised Ms. Mikakos for her efforts in assisting the Greek community in general. "I just want to pay tribute to Ms Mikakos. This grant is the result of her efforts. I want to make sure that the community pays respect to the job Jenny has done and thank her," he said. GCM President Mr Bill Papastergiadis thanked the Daniel Andrews government for promising “the largest grant to our organisation”. “It is with these grants we were able to build the foundations of this Community which is only a small part in the cosmopolitan Melbourne, in the society, the community that we all are living and embrace and make it a beautiful place,” he said. “This grant will help us continue the fantastic work our Board is doing. I think this government is one of the pure examples globally that works hand in hand with the community groups to ensure that they survive and grow and create the wonderful place we are living in. When we talk to our colleagues around the world, very few of them have the government support we and our Community have, and this is the result of the hard work Jenny, Steve and Phillip do, to ensure that. We could not have built this building if we did not have the $2 million grant we received from the State Government. 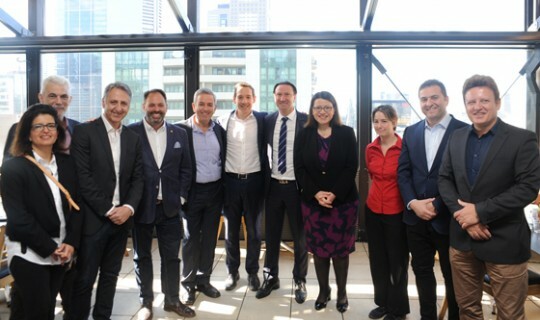 Board members Mr Christos Sikavitsas and Mr Michalis Karamitos also thanked ministers Mikakos and Dalidakis and MP Steve Dimopoulos for the grant and their continuous support. The announcement was made at the Greek restaurant “Melina on the Rooftop”, at the Greek Centre, and was also attended by GCM Board Members Ms Vaso Zagalis, Ms Tammy Iliou and Mr Jim Bosinakis.